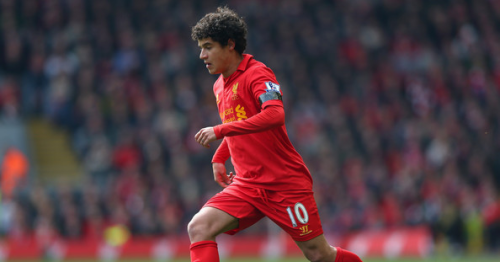 Liverpool manager Brendan Rodgers has praised Brazilian midfielder Philippe Coutinho, hailing the creative player’s value to a Liverpool squad that is making its return to the UEFA Champions League this season. Coutinho missed out on Brazil’s World Cup squad this past summer, so will be benefiting from a full summer of rest as the Premier League season fast approaches. “He’s certainly a valuable player and a great asset to the club,” Rodgers told liverpoolfc.com. ”He’s come in here and shown his quality, and really developed as a young player. Now he’s moving into the best years of his life as a footballer. “He came back with a great level of fitness – right on the limit of his weight. He’s in great condition, he clearly worked hard in the off season and since he’s come back we’ve seen in the games how strong and aggressive he is. Coutinho is in Liverpool’s starting eleven for tonight’s friendly against Manchester United in the final of the Guinness International Champions Cup. The creative midfielder will be battling with the likes of Ander Herrera and Darren Fletcher, who are starting for the Red Devils. Coutinho will be hoping to get the new season off to a flying start on the 17th of August when the Reds play host to Southampton, who have lost Luke Shaw, Calum Chambers, Adam Lallana, Dejan Lovren, and Rickie Lambert all summer, with the latter three joining Liverpool. Brendan Rodgers and his side also play champions Manchester City and Champions League hopefuls Tottenham Hotspur before the end of the month. Stay tuned to Premiership Talk for coverage of the International Champions Cup final from Miami, Florida.